Mish's Global Economic Trend Analysis: Long-Term Treasuries Rally in Face of Increasing Odds of September Hike; Taper Tantrum in Reverse? 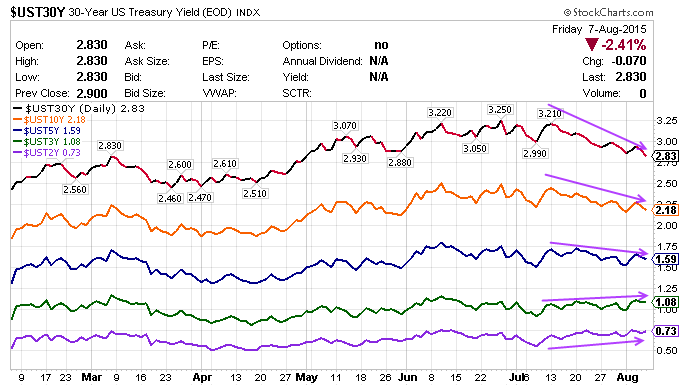 Long-Term Treasuries Rally in Face of Increasing Odds of September Hike; Taper Tantrum in Reverse? The odds of a September rate hike rose today on the heels of a good, but not spectacular jobs report today. The Financial Times reported "After Friday’s figures, traders expressed more confidence that rates would go up next month, with federal funds futures implying a 58 per cent probability of an increase after the US central bank next meets, compared with roughly 50 per cent earlier, according to Bloomberg data." 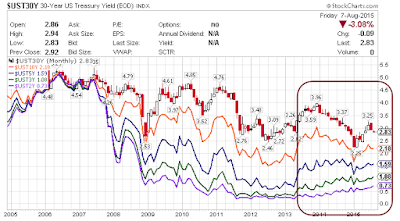 On August 5, in Fed Yap vs. Futures; Bloomberg vs. CME; Eighth-Point Baby Hikes! I noted a discrepancy between CME odds (then at 0%), vs. Bloomberg odds (then at 48%). Bloomberg has it correct, see the link for an explanation. Please recall what happened when Greenspan first started hiking rates at a "measured pace". The long end of the curve blew out, as in rising rapidly. 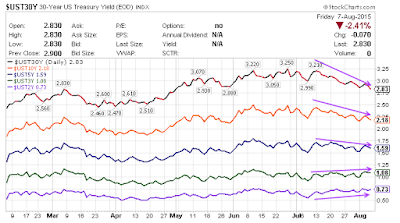 In simple terms, the bond market actually believed a recovery was underway and started rapidly pricing in hikes. The Yellen Fed has gone out of its way to say hikes will be slow and data dependent, but even still, one might reasonably expect the long-end to steepen somewhat. It hasn't. It appears to me we have a taper tantrum in reverse. 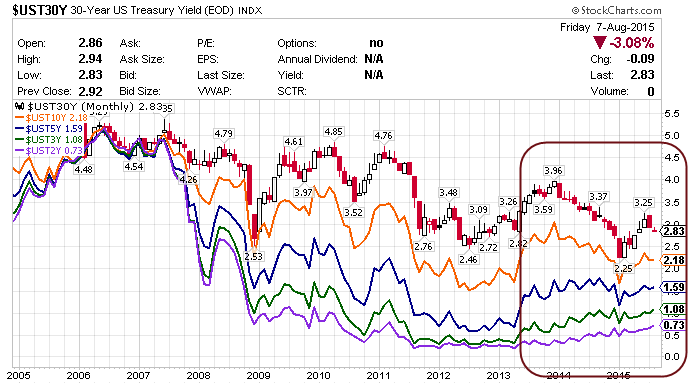 Simply put, the bond market is acting as if even Fed "baby step" hikes will hike the economy into recession. For further discussion, please see Taper Tantrum Coming? It Won't Be Where Nearly Everyone Is Looking! The Next Tantrum.